The ruling Liberals have won a slim majority in an election in the mainly French-speaking Canadian province of Quebec, according to official results. 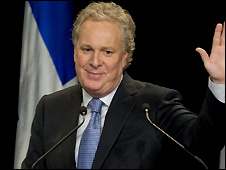 Liberal Premier Jean Charest called the poll, saying he needed a majority to deal with the global economic crisis. He has been in office since 2003 and led with a minority before the vote. His Liberals took 66 of the provincial legislature's 125 seats, while the Parti Quebecois (PQ) won 51, the province's elections agency said. The Liberals had 48 seats in the legislature before the poll. They fought off a late surge by the PQ to take 42.05% of the vote. "We are facing an economic storm. Our economy is open to the world and the world is worried," Mr Charest had told supporters in his home town of Sherbrooke. "Quebec must do everything it can to resist this economic storm." The PQ won 35.15% while the right-leaning Action Democratique du Quebec (ADQ) came in with 16.35%, taking seven seats. ADQ leader Mario Dumont resigned after his party's collapse in the polls. The vote marked a breakthrough for the leftist Quebec Solidaire, which saw its first member - Iranian-born doctor Amir Khadir - elected in Montreal. The Quebec election comes as national politics are in upheaval, with opposition parties trying to topple the Conservative federal government. Last week, Canadian Prime Minister Stephen Harper won a bid to suspend parliament until January, blocking the opposition's attempts to bring down his minority government. The Liberals and New Democrats had signed a deal to defeat Mr Harper in a confidence vote that had been scheduled for this Monday and to form a coalition government. The Bloc Quebecois, the sister party of the Parti Quebecois, promised to support such a coalition. This prompted an outburst from Mr Harper. "At a time like this, a coalition with separatists cannot help Canada," he said, referring to the Bloc's desire for independence for Quebec. Mr Harper's comments brought the issue of independence back to the political fore, providing a boost to the PQ after they were eclipsed by the ADQ in the 2007 election. The main issue during the campaign has been the effects of the global financial crisis on Quebec.